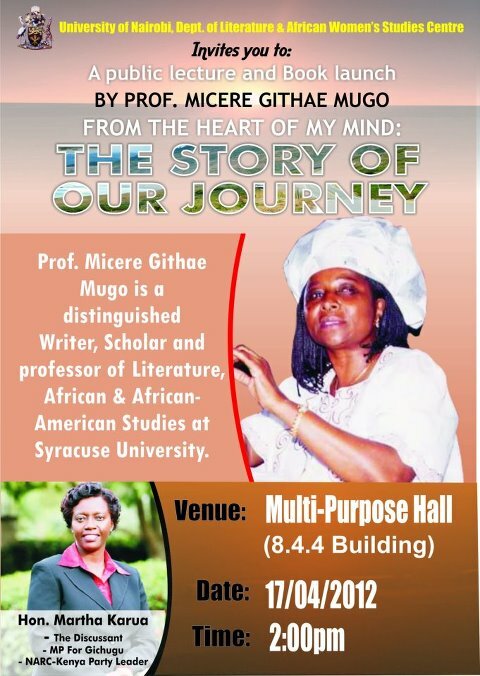 Last month I was lucky enough to catch Micere Mugo’s public lecture and book launch at the University of Nairobi. In an attempt to share some more informal thoughts and reflections, I just wanted to post about a couple of the ideas from her lecture that particularly resonated with me. 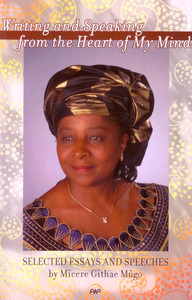 Poet, playwright and academic Micere Mugo was Dean of the Faculty of Arts at the University of Nairobi until 1982, when she was forced into exile and stripped of her Kenyan citizenship. As part of her lecture she mentioned that she first returned to the University of Nairobi at the end of December 2010 for a public lecture at the invitation of Kwani Trust (for Kwani? Litfest 2010). Just 16 months later she was back to launch her collection of essays and speeches Writing and Speaking from the Heart of my Mind (Africa World Press, 2012) to a standing-room only lecture hall packed with over 500 students, academics, writers (including Nurrudin Farah) and politicians. This, alongside her celebration of the University of Nairobi as a space that made her ‘who she is’ and made her ‘refuse to be silent’, was for me an interesting indication of a shifting and opening intellectual landscape in Kenya (and perhaps too of ‘public spaces’ and spaces for memory making), as well as the drivers behind this. She highlighted at the outset that her lecture would be given from her ‘head’ or ‘memory’ and not from a prepared text. She said this was in part because she’d been very busy in the run-up to the event, but also because she wanted her lecture to honour the tradition of ‘African orature’. This tradition she said was about not speaking to yourself, but having a conversation – and making sure that your audience is following and engaging with you along the way. Particularly interesting for me was the connection she then made between the form of ‘African orature’ and the idea of collective memory. She argued that in ‘African orature’ telling an autobiographical story is not about telling ‘my story’ but about telling ‘our story’. So (to use my own language not hers) a ‘personal’ narrative becomes a ‘public’ narrative. As part of this she talked about the importance of recognizing the collective part of ‘self-presentation’ and ‘self-recognition’ and about ‘liberating’ OUR story. Her lecture was not only an act of memory, it also recounted her own memories of growing up and her formative experiences moving through educational institutions from primary school to completing her PhD. And as she had promised ‘her’ story was intertwined with a collective narrative of politics and history, as well as revealing the development of the passions, thinking and beliefs that have shaped her life’s work. Mugo is an extremely inspiring speaker and left her audience, including myself, with a powerful message about taking responsibility for claiming your own space. But in addition to that, I was left mulling on how I might think more about her idea of the ‘form’ of African orature or autobiography as linked to the idea of ‘collective memory’. Any thoughts on this would be very welcome…and I think I need to buy her book!